The UTStarcom T66 is a clamshell phone which features both external and internal TFT LCDs (176X220 pixels), 1.3 megapixel camera with special camera modes with digital zoom plus a built-in 64MB T Flash. 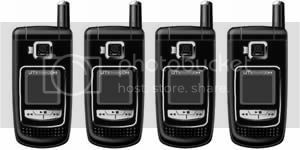 The phone also incorporates a MP3 and MP4 player with dedicated menu controls and FM radio. The T66 from UTStarcom measures 99X50X23.5mm and weighs 128 grams will be available in the colours black or silver, price unknown.